WRITER: Dr. Shobha Raju is also a very good writer. She has penned many stories and articles which were published by the popular magazines and papers like Andhra Prabha, Swathi, Andhra Bhoomi etc. She is also the author of a few booklets like “Sripadartham” (Commentaries to Annamayya Compositions), “Pedatirumalayya Parichayam” etc. POETESS: She has been composing many songs and poetry pieces right from her childhood. She always responded to every good and bad situation and happening in the society and expressed her views through her compositions with an intension of bringing about a positive awareness. 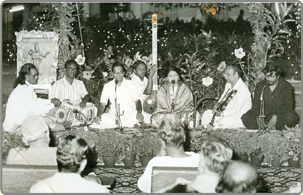 Her compositions are bought out into audio albums by different audio companies and temples. ORATOR: She is much sought after person as a guest to various functions and her speeches are very well appreciated. Music Composer: Dr. Shobha Raju has been a well acclaimed music composer. Different audio companies have brought out her albums for which she herself set the music. She is also the music director for the Tele serial ‘Sri Annamacharya’. She is the Director of many video programs, including the Tele serial ‘Sri Annamacharya’. She is an organizer of many events and festivals. A teacher of unique & effective methods.